Oppo K1 with an in-display fingerprint sensor and an FHD+ display launched in India at a price of Rs 16,990 on February 6. The newly launched Oppo K1 is one of the most affordable devices that comes with an in-display fingerprint sensor. The phone is launched in India with a price tag of Rs 16,990. On the basis of specifications and price, it seems like Oppo K1 has to compete with phones such as the Xiaomi Poco F1 and the RealMe 2 Pro, which also comes around the same price in India and packs decent hardware under a reasonable price. It would be interesting to see whether Oppo’s new device would able to emerge as a winner in a battle with smartphones that belong to companies like Xiaomi and RealMe, which are known in the Indian market for launching best budget devices. When it comes to design, every other smartphone in the market nowadays looks almost the same. The Oppo K1 is stylish and looks premium as well because of the glass back, which we have seen in many other mid-range segment smartphones last year. The phone sports a tiny water drop-notch on top of it, same as the RealMe 2 Pro that also comes with a teardrop notch on the top of the display. However, the Oppo has provided an in-display fingerprint sensor in its latest device, which is missing in the RealMe 2 Pro and the Xiaomi Poco F1. On the other hand, the Xiaomi Poco F1 is very traditional in terms of design as it has a big old notch on top and fiber back. 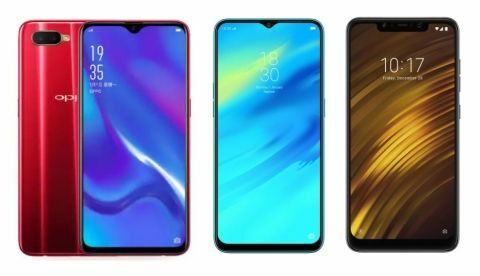 When it comes to the display, the Oppo K1 sports a 6.4-inch FHD+ display that offers a resolution of 2340 x 1080 pixels, while the RealMe 2 Pro features a slightly smaller 6.3-inch FHD+ display that offers the same resolution as the Oppo K1. On the other side, the Xiaomi Poco F1 comes with a smaller 6.18-inch FHD+ display that offers a resolution of 2340 x 1080 pixels. The Oppo K1 is powered by a Qualcomm Snapdragon 660 octa-core processor, which is paired with an Adreno 512 GPU. The RealMe 2 Pro is also backed by the same Qualcomm Snapdragon 660 octa-core processor, which is clocked at 2.0GHz. When it comes to the Xiaomi Poco F1, the phone is powered by the latest Qualcomm Snapdragon 845 processor, which is faster than the Qualcomm Snapdragon 660 chipset in Oppo K1 and the RealMe 2 Pro. The Oppo K1 is launched in an only 4GB/64GB variant. On the other hand, the RealMe 2 Pro is available in 4GB/64GB, 6GB/128GB, and 8GB/128GB options, while the Xiaomi Poco F1 comes in two variants 6GB/64GB and 6GB/128GB storage models. The Oppo K1 features a dual camera setup on the back that consists of a 16MP primary camera and a 2MP depth sensor. At the front, the device has a 25MP unit for clicking selfies. When it comes to the RealMe 2 Pro, the phone sports a dual 16MP + 2MP rear cameras along with a 16MP camera on the front. At last, the Xiaomi Poco F1 comes with a dual 12MP + 5MP rear cameras and is equipped with a 16MP front shooter. The Oppo K1 packs 3,600mAh battery, while the RealMe 2 Pro comes with 3,500mAh battery that is coupled with AI power master, which ensures longer battery life. The Xiaomi Poco F1 boasts the largest battery here as it comes with 4,000mAh battery that supports fast charging as well. The Oppo K1 4GB/64GB variant is launched with an MRP of Rs 16,990, while the RealMe 2 Pro 4GB/64GB, 6GB/64GB and 8GB/128GB variants are priced at Rs 12,990, Rs 14,990 and Rs 16,990 respectively. If you’re aiming to go with the Xiaomi Poco F1 then its 6GB/64GB storage model is available for Rs 19,999 and its 6GB/128GB variant is priced at Rs 22,999.